Made in Sydney, New South Wales, Australia, 1972-1979. Poster featuring images of circus performers with juggling balls on indigo background. The full wording is: 'Wimmins Circus / Sydney - August / 7 Shopfront Theatre 8.00 pm / 9 Glebe Town Hall 8.30 pm / 10 Women's Warehouse 4.30 pm'. 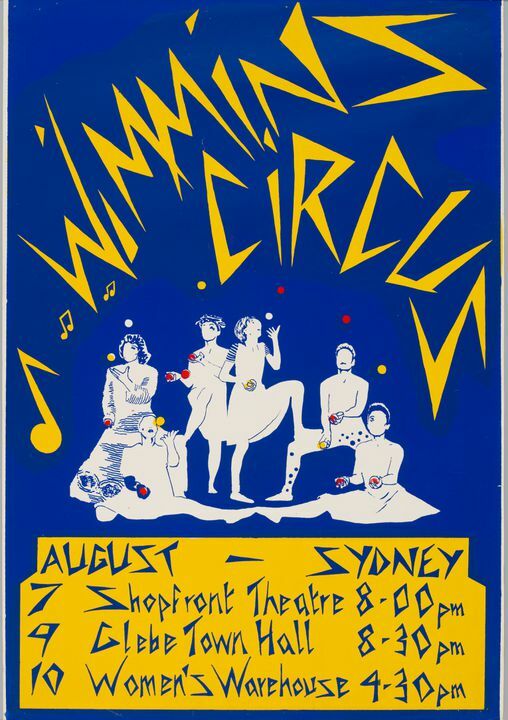 Poster created for the Wimmin's Circus (1979-1981), the first women's circus in the world, based at the Pram Factory in Carlton, Melbourne where it had use of the Circus Oz gym. The first Wimmin's Circus show was performed in July 1979 as part of the Art Attack event organised by the Women's Unit of Swinburne College. This was followed by two years of performances in and around Melbourne and sell out tours to Adelaide, Perth and Sydney. The collective included Hellen Sky, Eve Glenn, Nina Boderenko, Bev Fisher, Sue Bradley, Andy Pearce, Ursula Harrison, Rose Wise, Sarah MacNamara, Christine Evans and Ollie Black, with Leslie Forsyth and Mandy Smith working as stands-ins on tour. Reference: Ollie Black, History of Wimmins' Circus: Melbourne 1979 - 1981 Active Feminism or Feminist Activists? This poster is from the Di Holdway collection of posters accumulated over 20 years in Sydney, Alice Springs and Darwin and largely focuses on the work of print makers who first worked with the Earthworks Poster Collective at the Tin Sheds, University of Sydney. Di's involvement with the Tin Sheds began in 1974 when she was working at the Students Representative Council--initially as a secretary and later as its CEO. Dianne Margaret Holdway (died 2001) was close to a number of 'Earthworkers', and during 1974-76, volunteered as a printer and 'racker'. After finishing work at the Students Representative Council, Di worked at the South Sydney Women's Centre and worked closely with the Sydney University Settlement, both located in Chippendale. In the 1980s, Di worked for Aboriginal organisations in the Northern Territory. Throughout this period, Di kept in touch in particular with Michael Callaghan of Redback Graphix, originally from Earthworks Poster Collective, who was at that stage commissioned to produce posters for a number of Central Australian Aboriginal organisations. The posters in the Di Holdway Collection reflect their times, of course, but also represent Di's wide political and social interests over a period of two decades from the 1970s to 1990s. They very much represent her friends and work mates from the period. Some of the posters are represented in public collections such as the Art Gallery of New South Wales and the National Gallery of Australia.